Curtis CordWelcome to On Olive Oil, Giuseppe. Giuseppe TaibiHappy to be here. 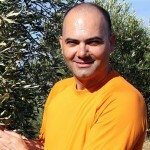 Curtis CordYou’re a fourth generation olive oil producer and a tech entrepreneur. Curtis CordTalk about polar opposites, new tech and old school. What’s that about? Giuseppe TaibiThat is the result of being born in Sicily in a place, in a town that was founded by the Greeks 2,500 years ago, but somehow having the gene of being an innovator, so being drawn to computers and programming since when I was 14. This has been the theme of my entire life, how to balance these two sides of my life, of myself. All the traditions that I was born with, which are for sure the envy of the world in many regards, but at the same time the very same traditions that enrich the culture can also be the reason for slowing down progress. Curtis CordI imagine that really both sides of you, if we can call it that, your tech side and your olive oil production, they’re really essentially both problem-solving, aren’t they? Giuseppe TaibiPrecisely. That is exactly what it is. At the end of the day it is finding where there are problems and coming up with original, innovative solutions. The two worlds, actually, now after so many years of practicing, I feel like they very nicely support each other. Giuseppe TaibiFor sure, let’s take the first angle, which is my professional life as a tech entrepreneur. Being a tech entrepreneur in, I live in Boston in the United States, there’s a lot of tech entrepreneurs here, let’s put it this way. I’m sure I am very good. I consider myself pretty good, but there are others who are also just as good. It is a very nice option to be able to strike a conversation about olive oil and then even give a sample of the olive oil to the folks that you work with or that you are interested in forming a new relation with because that is the one thing that they will always remember. Giuseppe TaibiVery few people have that option in their networking arsenal, the option to connect with other people in the high-tech world with something low-tech but extremely high quality as olive oil. Curtis CordYou moved to Boston some time ago, I think to pursue your advanced degree, and you decided to stay? Giuseppe TaibiYes. It was a particular time in history when the internet was really booming. I originally came at the end of ’98 for doing in fact some artificial intelligence research for a doctorate degree and then I found an incredible environment here, very much set to be leader in the high-tech world, entrepreneurship and venture capital and all that. It was very easy to decide that, given my professional interest, given my drive and my passion, Boston was the right place to stay. I was fortunate enough to also have met my wife here who is an artist, and she actually now is the chair of the Studio for Interrelated Media at Massachusetts College of Art in Boston. Back then she was an artist interested in tech and I was a techie interested in arts, so we met at the Boston Arts Festival. Curtis CordWhen you first arrived in Boston and you surveyed the scene for olive oil, what did you find there? Giuseppe TaibiOh, that is precisely what triggered the notion of okay, this is so not where it should be as far the options and the quality of olive oil. I immediately came up with okay, first of all, in order for me to even survive in this environment which is not my climate and my food options, I must have my own olive oil here. Then it became pretty natural, again, being an entrepreneur and with many other people actually who I was sharing my olive oil with saying, “Oh, this is so good. You’ve got bring it to this and that.” I was encouraged to actually figure out who were the leaders, the opinion leaders at least in the high end food world here in Boston. I connected with them. They simply got introduced, provided some samples and the response was fantastic. Curtis CordThat’s in 1998, did you say? Curtis CordIt’s been almost 15 years since. Curtis CordDo you remember looking back in the year 2000, 2001 speaking to people in Boston about olive oil, what they knew about it? Has that level of understanding changed over the years that you’ve been watching it? That is still the number one question. I would say to answer your question is yes, there is for sure an increase in the sense of awareness about the fact that olive oil is not just a simple bottle you pick form the shelf at the cheapest price, but there’s much more to learn and to be aware of. Curtis CordWhat’s the family farm like? Giuseppe TaibiWe have 2,000 trees. We have two cultivars that we have. It’s nocellara del belice and biancolilla. The nocellara is a kind of olive that is actually found now also here in, at least in Boston. I’m sure it’s somewhere else too, at the Olive Bar it’s called castelvetrano. I don’t know why they chose that particular name, but it is because Castelvetrano is where these olives are in great quantity. It’s an olive that is great for eating but also for making olive oil. The way I describe the olive oils that we make, the nocellara, the biancolilla is sort of like similar to wine. I say that nocellara is great for the kind of recipes and dishes that are typically paired with a red wine because it’s bold and peppery. Whereas biancolilla, which is smaller than nocellara, and it’s really exclusively grown for making olive oil. We call it the cashmere glove of olive oil, of flavor so it goes with all the kind of dishes that are typically paired with white wine. It could be caprese salad, it could be delicate fish dishes. That’s how we would look at it. Curtis CordI was wondering about that. You just returned from Italy where you participated in the harvest. How did that go? Giuseppe TaibiThe harvest is one of the top moments of the life in the olive grove. It’s very intense. There’s a lot more people on the ground than normally. In this case there were about eight people, plus me, nine. It starts at 7:00AM and it’s like going, picking, picking, picking, picking up until about 4:00PM with a stop for an hour or less for lunch. I am there helping, but I’m also there providing all sorts of support, making sure if somebody needs like let’s say fuel for a generator which we use for powering our tools, okay, I can go and run to the town nearby, get it and come back. The morale, I’m making sure everybody is happier, everybody’s humming. We strategize a bit about which section of the olive grove we’re going to tackle. It’s really important to get into the rhythm. This year also I resorted to yet another innovation which is to stream live from the Olio Taibi Olive Grove as many moments of the harvest as I could possibly fit. It was really a huge success. Giuseppe TaibiLots of people. Oh good. Curtis CordI watched it and it was interesting. The olives, I have to say, looked like they were in very good condition. Giuseppe TaibiAbsolutely. We’ve had phenomenal quality of the trees and the fruit this year. Absolutely zero defects. We are very excited about the oil that came out. Curtis CordWere you harvesting the olives at the same time as your neighbors or a little earlier? A little later? Giuseppe TaibiI am definitely on the earlier side. In that regard I’m also an advocate for trying to rally everybody there to go and do it the right way which is to pick on the early side when the olives are still green essentially. Which as you know, Curtis, is the best time for the highest quality. Giuseppe TaibiThe culture of the neighbors there is that they don’t have that much exposure to the international scene as much as I do, so they don’t have yet that kind of level of awareness of doing things in a certain way. Because they also sell most of their olive oil in the local market. Curtis CordThey’re really looking for yield. Giuseppe TaibiThey’re looking for yield. They’re not doing the awful things of picking the olives that fell on the ground, but they generally are more concerned about yield. They’re concerned about quality. This is really mostly because the local market isn’t quite there yet. Which is very interesting because why is it the case is the question. How is it that olive oil in that region, doesn’t everybody do it the right way? I think that the answer is because this level of quality that we aim for is actually a new culture. It is an innovation because for many, many, many years, practically forever, the way olives have been picked and the way which olive oil has been made was really the worst possible way. Because the one thing that mattered was yield. Curtis CordInteresting. What’s it like when the family gets together there? Giuseppe TaibiIt’s a big moment of happiness and love. We all stay very close together for this time. It’s particularly joyful also because I come from the United States. That makes it even more special. Last year I was able to also bring my entire family from Boston, so my two daughters and my wife. This is something we didn’t do this year because there is school going on, so we couldn’t quite do that two years in a row. It’s certainly extremely joyful and we work hard. Especially because we pick and press the olives the same day the real challenge becomes what happens at the press. Because the press is a very expensive facility that it’s hard to justify even for an olive grove of our size. What happens there, there’s a tremendous amount of small, independent landowners. Somebody might have 10 trees, somebody might have 100 trees. They all show up at the press which to give them credit, they even put a new line for increased output, but still this year’s crop is so abundant that they can’t keep up. Easily I go there at 4:00, 4:00PM, 5:00PM and then I come back home at 2:00, 3:00AM. Curtis CordYou wait until it’s your turn and you watch your olives go through the press. Is that how it works? Giuseppe TaibiThat is precisely how it works. Curtis CordDo you leave with the oil? Giuseppe TaibiI do leave the oil, I personally leave the oil there because we put our silos in the same facility so that we minimize any potential issue to transportation. It’s a certified organic olive grove. We go to this press that also is certified organic for the press itself as well as the storing and then the packing. Curtis CordDid you taste your oil coming out of the press? Giuseppe TaibiI do, but I don’t put the finger. I take a little bottle, put it in there and then pour it onto a spoon or directly in my mouth. Curtis CordHow did it taste? Giuseppe TaibiOh, it taste fantastic. It’s like the magic moment is that one there, when you get it right when it’s just made. You can feel all the antioxidants that express themselves with the bitterness, like really completely taking over your palate. It’s real, it’s magic, it’s the reward. Curtis CordDoes your family enjoy it at the mealtime during harvest? Curtis CordHow’s the food there? Giuseppe TaibiThe food in Sicily, wow. Giuseppe TaibiOh, in our house. Okay, so we do eat a lot of vegetables. We love fish. The fruit, we mostly go with whatever is in season. There’s still that option. We still have that culture of eating what’s in season. For example right now there is prickly pears, up until last month there were prickly pears which are super good. We enjoy that. We also love eating a certain kind of weeds that actually grow spontaneously after the rain from the ground. We pick them from where the olives are. We pick them. We either quickly soak them or we quickly boil them, steam them, whatever and then we eat those. There’s a lot of that. We also eat the olives. We actually get the nocellara olives. We crack them. We put them with water and salt so that it gets some of the bitterness out. Then they are delicious. Curtis CordDo you think that the style of cooking in your family in Sicily has adapted somewhat to the profile of the olive oils that you produce on your land? I was wondering about that. Over the years through the generations of making, because for four generations has your family always made these two cultivars? Giuseppe TaibiWell, there’s been other cultivars that are ancient — we don’t need to know exactly what these olives are, but they’ve been there for a long, long time. I would say it’s probably a bit of a stretch to think that we have adapted the way of cooking to our olives. It’s more like that the way that these are such common olives in our area that it is automatic. It is really the way which we cook, it’s actually because of the way the oil is in the area. I wouldn’t go as far as saying that over time things have necessarily, I wouldn’t be able to pinpoint exactly where that match would be. Curtis CordIt works well, doesn’t it? Giuseppe TaibiIt works wonders. It goes without too much thinking, let’s put it this way. It’s like that. Yeah. Curtis CordGetting back to Boston. You came here, you met your wife. Then I guess decided to import some olive oil. Is that how it worked out? Giuseppe TaibiYes. It was pretty much like that. I didn’t think of okay, I’m going to go to the United States and I’m going to start importing my oil. No, it was first because I wanted it for myself. Then the realization that there was an opportunity to introduce such high quality product to people who might be appreciating it. Curtis CordDo you remember that first shipment? Curtis CordHow many cases was it in the beginning? Giuseppe TaibiIt was 130 cases, one pallet which cases of six bottles at that time. Now actually I’ve increased the size of the case to 12 bottles, but still half a liter. Curtis CordSo you had 700 bottles of your family olive oil from Sicily and you’re sitting there in Boston. Then what did you do? Giuseppe TaibiThen basically the way I do this, this kind of business development if you wish, is whatever is in my path, it could be a store, it could be a restaurant, I most likely I’m already a customer of that particular venue. I have developed some kind of relationship with the owner, usually it tends to be small, high quality. From that point on striking up the conversation, “Oh yes, my family makes olive oil. Oh I would like to try and here is the bottle. Try. What do you think? Oh, that’s great. Can we have it here? Of course. No problem.” A lot of that, the way I started was like that. To really go at a personal relation type of approach which I actually think is still today the one that makes the most sense for a product that requires a little bit of an almost education even from the ones who are sophisticated to fully appreciate the nuances of it. Curtis CordInteresting. Stay within your path at first. Talk to people you already know instead of trying to break the ice with a stranger. Giuseppe TaibiRight. Also I tried to understand whether or not there was for example the opportunity to work with a distributor and I don’t know, maybe I didn’t get good luck, but I didn’t feel that the distribution world was really capable of giving justice to a product of this kind. I feel like okay, I have to do it myself. Curtis CordHow many bottles are you importing now each season? Giuseppe TaibiNow I’m bringing about 5,000 bottles. Now I have a few more of these high end places, a lot of repeat customers of course and I also sell it online, on Amazon.com. It’s a lot of family and friends also who are definitely really great loyal customers. They tell other people. There is a certain amount of word of mouth. I’m also now at the point which I invested a little bit more of my resources and I am investing more of my time because I see the opportunity from the commercial point of view to be really good. I think I’m uniquely positioned having invested so much time already and having validated so many points of the value proposition that I can actually be a little bit more aggressive in getting in front of more people. New branding, new label. I’m planning to work a lot more with restaurants for the very simple reason that I feel like if you go to a restaurant, you are there to enjoy the evening. Just like the restaurant brings you bottled wine, I feel like the restaurant should bring you bottled olive oil instead of generic, undescript oil that comes in either a dish or in this refilled bottles that are even clear. Who knows how long these have been with oil sitting there. What kind of oil is there? I already have some restaurants who have expressed interest in coming up with this concept. I think that would be very innovative. Curtis CordWhat are some of the signals that you’re seeing out there that make you feel optimistic about the opportunity that lies ahead? Giuseppe TaibiIn general what I see there is more and more reference in the news about the benefits of high quality olive oil. I see also the level of curiosity and interest arising. Whether it is a cocktail party that I might be at, but also when I talk to potential customers or retailers or restaurants they notice something in the way I present the product and I see that it’s something that they have almost been looking for. For them it’s also an opportunity to get an education in olive oil. Which they have a lot of things to do so if they can talk to a producer like me as opposed to a sales person that may sell whatever, then they can really raise their olive oil IQ which will make them better cooks and make their customers happier and more loyal. Curtis CordHow much do you sell a bottle of olive oil for? Giuseppe TaibiI sell a case of 12 bottles for $200 at wholesale. Then online I sell one bottle for $49.95, shipping included or two bottles or more for $35 each. Again, shipping included anywhere in the country. Actually we’ve got some orders also to some kind of US military troops in Afghanistan. That’s exciting. Curtis CordThirty five dollars a bottle, that’s pretty steep. Giuseppe TaibiIf you compare to supermarket oil, absolutely. Giuseppe TaibiThere’s no discussion, but we’re talking about two completely different products. Actually if you look at the comparable quality oils it’s practically mid-point. There’s oils that go easily for 40, even 50. Curtis CordThere are a lot of people in these younger generations here in the states who get the idea of importing the oil made at the family mill or at their estate to sell it here in America. You probably met others who are trying to do what you’ve done. Have you? Giuseppe TaibiOh absolutely. There are several who are also trying to do the same thing. It’s pretty much a work in progress depending on long you have been doing this. I like to give people tips and advice. I actually like to even trying to partner with them because I feel there’s not just one olive oil that is the best in the world. Actually there are a lot of them and these olive oils tell a story. They tell a story of the olive, they tell a story of the region. Just like wine they tell a story of the makers. They are their own unique story and so just like wine, olive oil has the opportunity to delight people with all these different products and stories that are attached to them. Curtis CordYeah. Well, we see a lot of people who are trying to develop a market for their family brand. It’s not easy. Giuseppe TaibiNo, it’s not easy at all. It requires focus, it requires investments too. Investment of time and investment of money. It’s the kind of stuff that can easily bankrupt you. There’s people unfortunately have tried, lost all the money and probably folded. I would say I find a lot of inspiration really from the world of wine marketing and sales. I would say that to me seems like the one that has a lot of material that is available so you can actually go and look for books on this particular market. There’s not a whole lot of olive oil marketing material, but if you study the wine marketing and sales books and materials you actually will be able to fairly easily translate that to the olive oil work. Curtis CordWhat is an example of a lesson that you learned by watching the wine record? Giuseppe TaibiThere are different ways of positioning your brand depending on the size, depending on the price point. Each different brand needs the kind of tactics and strategies that actually make sense for that particular product and brand. It’s absurd trying to go to a supermarket distributor if you have a production of 10,000 bottles. That will never be economic case that will work in your favor. You will have to basically give away your high quality product. If you are lucky you will break even. Curtis CordCan you recall a decision that you made early on if your effort that got you on the right track? One piece of advice for others who are trying to do this and who might be facing some big challenges. Giuseppe TaibiI’d say that I would probably say that the one thing that you really need to be extremely serious about is quality. Olive oil is the kind of product that one thing goes wrong, you don’t even realize that it’s going wrong, and it ruins your product. This is like an obsession with quality is extremely important. At the same time I would say if you are in the olive oil business then you care about quality and that’s your type of market then you have to tell your own unique story. Now the simplest most natural way of telling the story is to have a product that isn’t mono-cultivar. Like we do. We have two kinds of olives, but we don’t make them, we don’t make a blend. We actually pick and press the cultivars separately. On that you can build a story. You can build a story of the particular taste profile, of the olive oil that comes with that particular cultivar. There are I think over 1,500 cultivars that have been cataloged on the planet, so that is an incredible wealth of stories and that you can build on top of the particular cultivar that you happen to have in your olive grove. Curtis CordPeople understand that because again, there are the parallels to wine and the different types of wine that are available. Giuseppe TaibiYeah and I think that if you piggyback on something that people understand like wine which is much more widely understood you are in a better shape than instead trying to explain all the technicalities of what makes your olive oil so good. Curtis CordHave you ever considered crowd funding to help raise money for your business? Giuseppe TaibiI actually started much earlier, so crowd funding wasn’t really available back then. I haven’t. It might be an option for somebody who is starting now. Curtis CordWell, because actually you do see here and there on the crowd funding sites initiatives like that where someone wants to bring in a couple of pallets from the family farm in Greece or in Italy or in Spain and market them here in the States. Giuseppe TaibiYeah. I haven’t been keeping track of those. Have you? What’s the success rate of that? Curtis CordI don’t see much of a success rate there actually. In fact I see most of them or nearly all of them not reach their funding goals that way. There are a few success stories here and there. How important is social media to your company now? Or do you think it’s at the early stages of helping you? Giuseppe TaibiI would say it’s something that I am seeing as an investment, as a way to connect with the right audience. It is important. I would say that every kind of channel has its strengths and its weaknesses. Social media has the strength of being very much in the moment, so whenever there’s something that is interesting I retweet something or make a comment and connect with others. I feel like I can make connections. I can provide almost a service by curating all the many news that come to me. I have a Google Outlook for example everyday gives me whatever Google finds that has olive oil inside it. Sometimes I find something that is worth sharing and I go ahead and share it. Other times, this actually comes from the Olive Oil Times. You guys do such a great job. Giuseppe TaibiCompetitions, absolutely. This has been another important thing. I think going into competitions is one of the best ways to really understand what you have in your hands. Again, in the olive oil world you find all the people who say, “Oh I have a fantastic oil.” You actually have no idea what you have until you go through a serious competition. That’s got to be hard for people to figure out which one are the most serious. I can say that in my experience the New York International Olive Oil Competition has been extremely serious. The feedback I get and the people I connect with there are absolutely the best in the world. I highly encourage anybody who wants to follow this path to do that, to participate in the competition. You might not win, but you will know where you stand. You will be able to do whatever it is to make it better next year. Curtis CordThe harvest is over now and do you know how many or do you have any measurement of the yield? Or is it still going on? How long does it take, the harvest at your farm? Giuseppe TaibiWe actually are done with the olive harvest. We have completed that by the end of October. The harvest requires the ground to be dry, so we want to start earlier. We got some early rain so we had a few stops here and there, but we were able to complete the harvest in a month, in October. Now as far as the yield goes, our yield is pretty consistent. It’s like 15%. Now we are in the process of filtering our oil because we do filter it. Then packing it and have it shipped to the United States. Curtis CordWhen will you receive it? Giuseppe TaibiThis is something that I wish would be on time for the holiday shopping season, but I feel it might be a little bit too challenging just because the personnel that does the packing is still very busy with the pressing. The harvest and the pressing in Sicily goes on pretty much throughout October, November and a good half of December. Now, it does slow down pretty much half November, so I am working everyday with the folks who are in charge of packing to see how fast we can accelerate the process, because the sooner we have it here the better it is. Curtis CordIs that important to have it here for the the holiday season? Curtis CordYou wouldn’t send it by air, would you? Giuseppe TaibiOh, by air, no. Then it would be really too expensive. Giuseppe TaibiVery much the cost by air is a whole other magnitude. Curtis CordWhere can people find your olive oils now if they want to buy Olio Taibi? Giuseppe TaibiSure. I will be putting it on Amazon again pretty soon. Right now I don’t have it so I can’t put it. I do have some from last year that will make available for anybody who really wants to get it. Then they can go to our website and find the links there for the retailers. Otherwise is if you want I can give you some names here in the Boston area. There’s Dave’s Fresh Pasta which is in Somerville in Davis Square. There’s Central Bottle which is a fantastic wine store in Cambridge who also has my olive oil at the moment. There’s a very nice organic farm here in Lexington which is where I actually live. It’s called Meadow Mist Farm. They have fantastic produce and they also sell my olive oil. Up until last week it was available also at the Brookline’s Farmer’s Market. More retailers will be added very soon. We’ll find them on OlioTaibi.com. Curtis CordMr. Giuseppe Taibi, thank you for joining us today. Giuseppe TaibiCurtis, this has been always a pleasure talking with you. Thank you so much for having me. Narrator:On Olive Oil is produced in New York by Olive Oil Times, the world’s leading olive oil publication. To listen to past episodes visit OnOliveOil.com.